I just want to say a huge thank you to the DBS members who rallied to help four donkeys in need. Enough money was raised to buy hay to keep the donkeys supported whilst difficult decisions needed to be made by their owner who was in a very sad and extremely distressing situation. 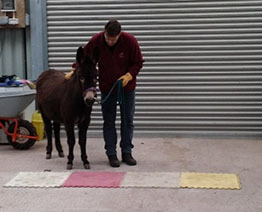 The Donkey Sanctuary gave assistance to ensure all four donkeys had a much needed hoof trim and two of the donkeys are now settling into a new life at The Donkey Sanctuary where their health and general well being is improving every day. The other two donkeys remain in their original home where there is enough grazing and hay to support them. The owner is extremely grateful for the support she has received and now knows who to call if her situation deteriorates in the future. Thank you to all of the kind hearted members who helped. Recently we were alerted to 4 donkeys in our local area with no fodder and an owner distraught as to how to cope. Very quickly 8 donkey owners wanted to help, so we all clubbed together to buy £105 of hay and get it delivered to these donkeys that afternoon. The donkeys had their needs that afternoon met and the DBS Advisor has now sorted that 2 of the donkeys will go to the sanctuary, the farrier to call and the owner to be supported with her 2 remaining donkeys. Everyone was pleased to help, all recognised that the owners plight could have been any of us if circumstances change. In the days following this incident the kind owners who had helped began asking if we could have an emergency fund for this type of situation. I explained that DBS members can run a Wales account, but that we would need a Committee, Secretary, Treasurer and Chair to represent DBS Wales Region. We hope to run small fundraising activities at our events, and build up a charitable fund which the newly formed committee would oversee. This fund would need to be used for the good of donkeys, but could be used in situations like the above 4 donkeys, or indeed to help provide quality training to members. This year a large number of members have not renewed their membership in Feb 2018. In the hope of encouraging more Welsh members, this newsletter will be sent out to past members and potential new members. It’s easy to join on the DBS website. If you would like to be a member of the new committee or take one of the seats to help run DBS in Wales you do need to be a paid up member of the society. 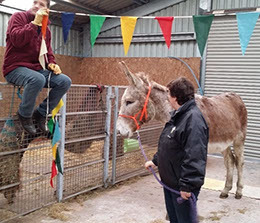 A client evening organised with Dyffryn Tywi Equine Clinic and The Donkey Sanctuary was well received on Wednesday 4th March. 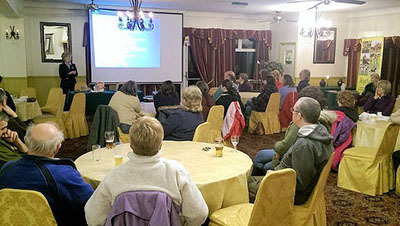 Around 40 attendees were offered refreshments whilst listening to a talk given by The Donkey Sanctuary’s welfare vet, Anna Harrison. 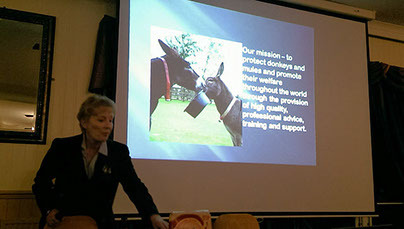 Anna talked about donkey health and how to best care and manage them for optimum welfare. She stressed the importance of using qualified professionals who were experienced and interested in working with donkeys. 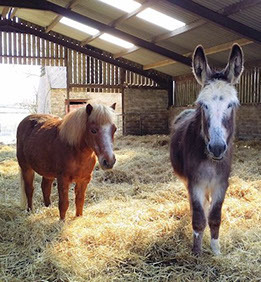 Particularly using equine specialist vets as they understand and have experience of the complexities of donkeys and understand that a donkey being “a bit off colour” is quite often a medical emergency due to the stoic nature of these equines. The evening raised over £80 in donations and over £80 of stock was also sold. Thanks to all those who attended and I will be organising similar events in the near future in other areas of Wales in conjunction with equine veterinary practices, so please do get in touch if you are interested in having one in your area. Our network of donkey friends and supporters have planned to work with a variety of community groups providing picnic walks and donkey contact sessions. 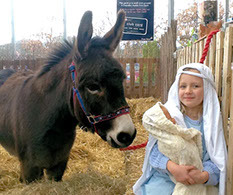 We hope to attend a few local shows to share our enthusiasm for donkeys with others. 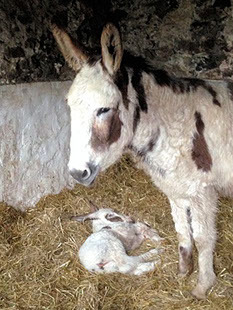 We added to our donkey numbers in October with a new coloured donkey called Nutmeg. Nutmeg settled will and was a good companion to Walter. She has begun to join us on walks and is proving to be a popular donkey. Her training has however been postponed for a while as she has just had a beautiful colt foal. Our networks and support systems in this area are growing, as are the number of donkeys. The North Wales branch of the DBS are looking forward to a busy season. I know that I am biased, but my Sanctuary Foster donkey Enoch makes me so very proud. As part of his 8 activities in the ADA award, Enoch makes plenty of very special visits. This week the South Wales Guardian ran the front page with this article and picture. The active donkey award (ADA) is a fun and rewarding programme. If you would like to get involved either discuss it with Ann or contact Terri Morris the co-ordinator through her articles in our magazine Bray Talk. REISDENTS of a Capel Hendre care home were delighted at the arrival of a surprise Easter visitor. 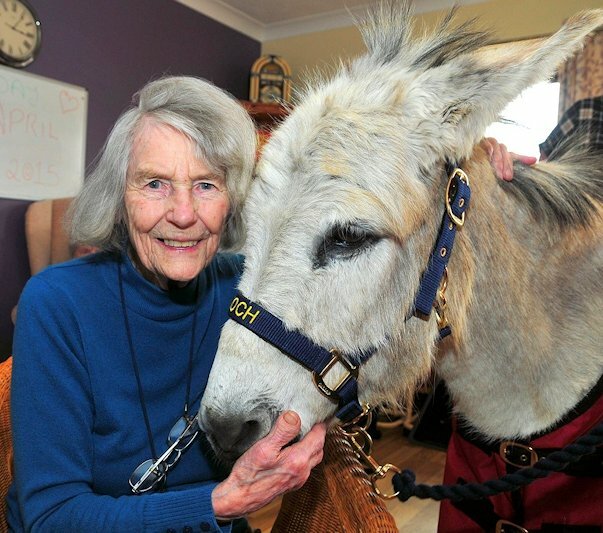 Enoch, a 22-year-old donkey, charmed residents and staff when he staged a walkabout at Llys Newyedd care home. Enoch was brought to the home by Bryndafydd Animal Assisted Therapy Wales (BAAT), based at Llandeilo, and has become a regular visitor to hospitals, day centres, nursing homes, schools, shows, events, nativities and parades. Cathy Evans, care support officer at Llys Newyedd, said: “Most of our residents have dementia, so it is very important to keep their minds stimulated – and the visit from Enoch certainly made an unusual sight as he toured the building.